THE ROAD TO KHALISTAN: Blue Star Massacre Widget. 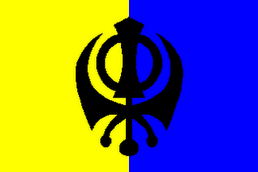 I have made this widget - also in the sidebar to the right - to commemorate the shaheeds of the Bluestar Massacre. While you're there, feel free to look through that website. I set it up to thank the people in my life who need thanking. That most certainly includes you, my faithful readers. The pages are meant to be read in order and start at the home page: Thanks, Gurufateh and Chardi Kala. I'd like to be able to add something like this, but am restricted from doing so. 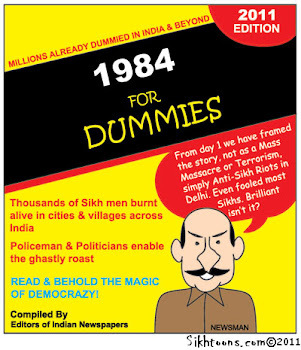 We need to keep continual awareness of the June 1984 atrocity. That's quite all right. I understand. After all, you do have a link to my blog, which is much more than I would ask for or expect. I appreciate and I think enough of us are now making enough noise that 1984 won't be forgotten. This is done very well, Mai. I wish I could make something this cool. Infact, I have seen a load of changes in your blog since I visited the first time. I suppose you have been learning new stuff. Hi, H. Maryam! Always a pleasure to see you. When I started this blog, I was a rank Internet Newbie using Widows '98 and a free dial-up connexion. Very reliable, but slooooooow. I discovered mspaint and then paint.net. We finally got it together to get a DSL connexion and a very generous friend/supporter gave me this computer, fast with incredible storage. The he got me Photoshop CS4(Extended) and then the gif animator. I've been working very hard to learn to use these incredible tools effectively. I'm glad that it can be seen that I'm learning. This widget is a gif thing I made using old photos and the gif banner tool and some imagination. My next project to learn, I think will involve sound.